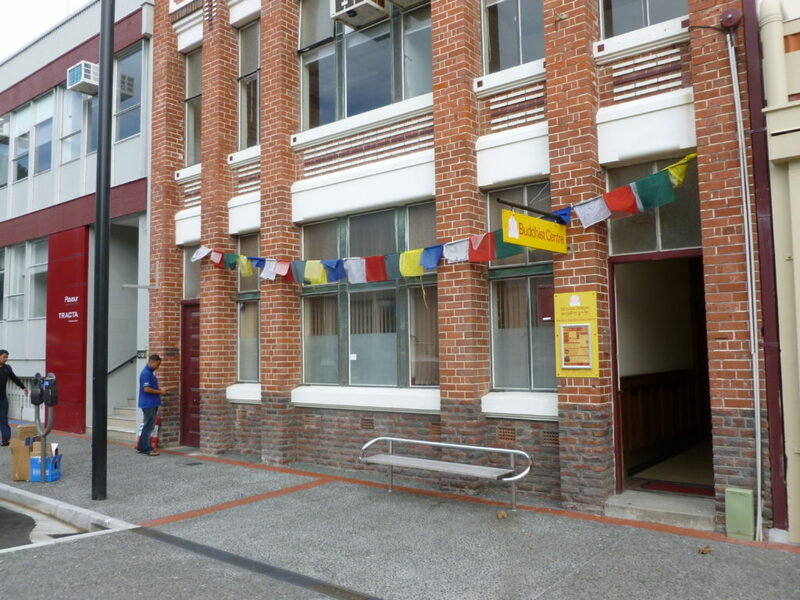 Our spiritual director Lama Choedak Rinpoche founded a Tibetan Buddhist Society in Canberra, which has two main centres in Australia that some of our members (12) have been able to do retreats at over the year. This is a very inspiring and supportive experience, and builds the vision of what is possible here. Our centre is run independently by a committee and so the relationship with the Australian centres is that of a “sister” centre. We receive emailed newsletters which we forward on to our members. Some of us are also members of that main centre and this enables us to access audiovisual teachings on Dharma, which we screen weekly as the base of our Thursday Study nights. We also receive periodicals and calendars from the Sakya Phodrang in Dehra Dun, India where the Heads of the Sakya Lineage live. 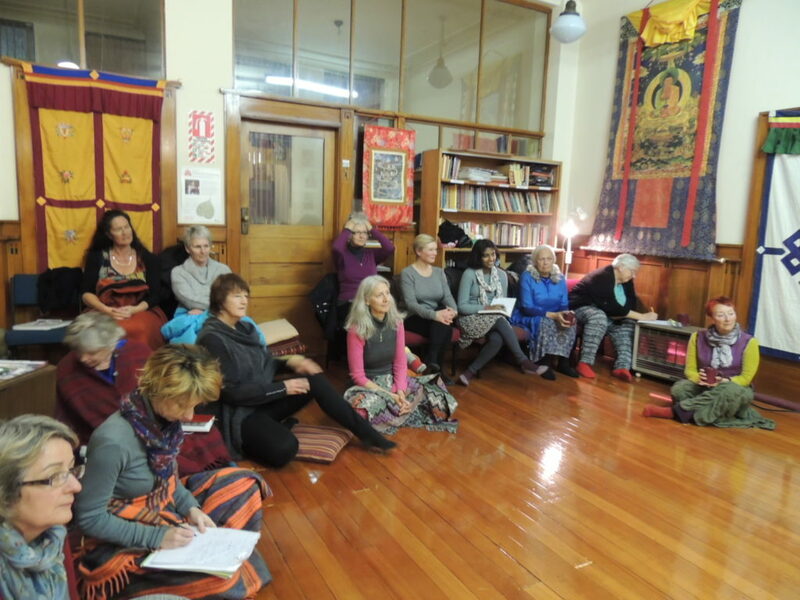 The current Sakya Trizin (the head of the Sakya lineage) has twice been a guest at our centre giving teachings and empowerments, and the previous Sakya Trizin met a group of our members when he gave teachings in Auckland in 2009. We have also had audiences with them while attending their teachings in Germany, Taiwan and Kuala Lumpur. These are occasions of rich Dharma connection. What kinds of support does your temple offer to members of your community who are under stress, sick, mentally ill, in crisis, etc.? Because we have no resident teacher, monks or nuns, whoever among the lay community has the time and the connection with the person will offer support. For the bereaved, we help in whatever way is possible, by doing puja in their home, keeping contact with the bereaved. We offer Soor, a prayer for the dead at their home. The benefits: The central location makes it easy to find and easy access for roughly half our membership. It’s great for foot traffic and for people to just pop in if the door is open and someone is in the temple. The Napier Library has relocated across the road from us and so more people get to notice where we are. There is a backpackers two doors down and young overseas workers/travellers come regularly to our evening meditation sessions. The challenges: It’s not so good having restaurant neighbours who have smelly rubbish, and the noise from patrons outside the new wine bar nearby. Parking is getting harder to find, even after business hours in the summer, and during retreat time on Saturdays people have to move their cars. What are your hopes/dreams for this community? Our strategic plan is to continue with a site in the middle of town and to also work towards having a rural retreat centre in Hawke’s Bay. We want to build on the services we offer and to outreach to different groups; for example, three of us have attended the Apprentice Buddhist Chaplaincy course through Amitabha and the New Zealand Buddhist Council in Auckland. We intend to offer group services to those faced with terminal illness and their families. We’d also like to offer a child-centred programme during the winter after school for children and their families to come along and explore dharma through stories, painting and prayer flag making, etc. This coming summer we will offer a ten-day retreat in a rural setting. We would like to maintain our current site in the centre of town and also have a rural retreat centre, possibly with an ordained resident monk or nun offering teachings at both centres. What do you consider to be the main positive contribution that your temple makes to the wider community? 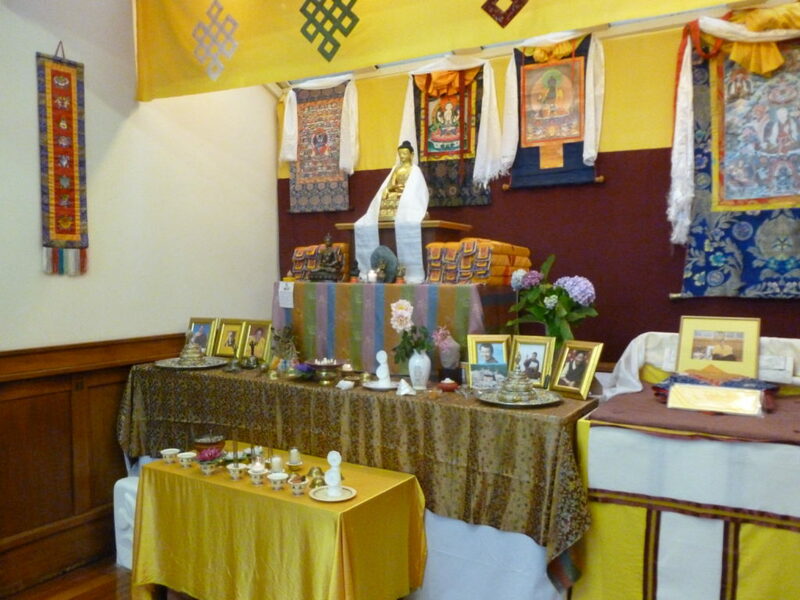 We provide a beautiful peaceful temple for meditation that welcomes all who want to come and visit and sit quietly or ask questions or make offerings. For 16 years we have provided training for people to develop greater peace and calm in their lives through our meditation courses and this has had a ripple effect in our community. We provide a community for practitioners of all levels who want to be with like-minded others and share practices and insights. What religious groups and/or community groups does your temple maintain occasional or regular contact with? Anglican, Baha’i, Methodist, Islam and others from the local Interfaith Week of Prayer for World Peace that happens annually; Springhill Recovery Centre weekly; Eastern Institute of Technology annually. Our centre hosts one activity during the Interfaith Week of Prayer for World Peace and our members attend other activities in that week at other churches, mosques or other venues (such as a public park or the Heretaunga Women’s Centre). Relationship with tangata whenua? Informal and open but no Kaumatua or Kuia connected formally to the centre. Our Trust Deed specifies we need to uphold the Treaty of Waitangi in our activities. This we do through acknowledging local spirits and deities in our Soor and Tara Pujas, and including all beings in our twice weekly “Prayer for the Happiness of All That Lives”. A longer version of this article can be downloaded here. Previous Previous post: Peace Symposium: Loyalty to State or Faith?